The Yealink SIP-T46G is an aesthetically updated and technologically superior SIP phone for business. With a 4.3” 480×272 resolution color LCD screen, 16 SIP accounts, and 10 paperless DSS keys, the SIP T46G looks and feels like the phone for executives. Programmable keys, USB dongle, and Gigabit Ethernet are just some of the ways you can expand the capabilities of this SIP phone.. 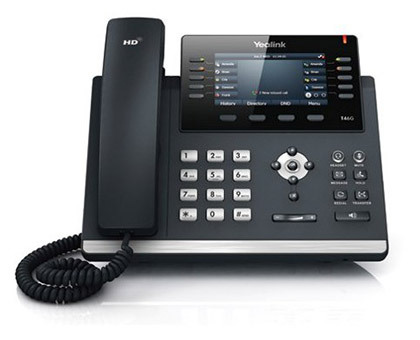 The SIP T46G utilizes the fan-favorite Yealink HD Audio handset and speakerphone, 10 paperless DSS keys with dual color LEDs, a 4.3” 480×272 resolution color LCD, and a dual-port Gigabit Ethernet integrated PoE. With its all new sleek appearance, the SIP T46G has a scratch-resistant surface, non-slip rubber pads, a mirror style screen, and an anti tangle cord for its HD handset. This SIP phone delivers as much quality as you’d expect from a Yealink, while looking futuristically impressive. The HD handset and HD speakerphone included with the SIP-T46G are the clearest sound available to any line of SIP phones on the market. An included USB port on the SIP T46G increases the phone’s functionality through the use of USB dongles. Use Bluetooth, Wi-Fi, and USB recording features with ease.